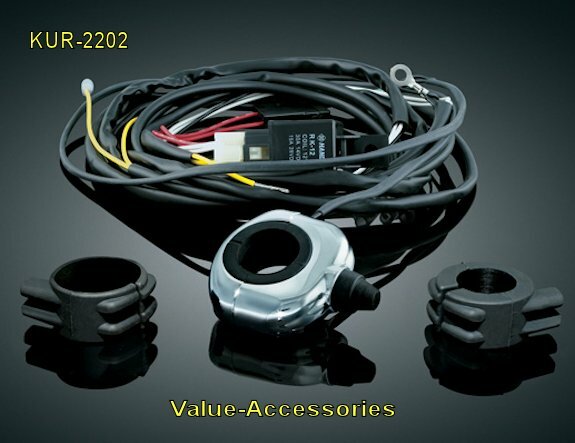 Select Std or Deluxe Kit Standard Wiring Kit Deluxe Wiring Kit w/Handlebar Sw. The Standard Kit provides you with a Switch, Relay, Universal Wiring Harness, Fuse / Holder and general instructions for installation. Your other option is the Deluxe Kit which is the same except adds a super clean chrome handlebar mounted push-button switch making it very easy to power up your lights whenever desired. Handlebar Switch mounts on 7/8", 1" or 1 1/4" bars. 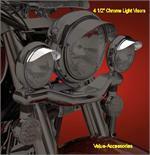 These kits are not intended for any particular application, but is easily adaptable to any motorcycle. These kits are quite complete. Kits comes with the relay all wired up to a harness, making this much easier for someone that is not that experienced in installing wiring circuits. The time saving alone is worth it for this kit. * White wire with in line fuse and ring terminal to 12 volt power (battery +), cut off ring terminal if not needed or other lug is used. * Group of four wires (encased in plastic wire loom), route to driving lights. One white and one black to each light. 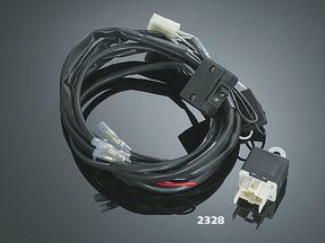 The female connectors that are installed on these four wires that go to your aux lights can be used or cut off. If you cut off the quick disconnect connectors, you can just solder the wires instead to your light connections. * Single Red wire to source of switched 12 volt power (on with ignition switch). * Each Black wire, Grounded to chassis (bare metal) or light housing. Some lights have only a power feed and are grounded through the mount. You can ground at the mount for these lights. * Each White wire, Connect to the single power lead from each light. * We suggest soldering everything possible. * Run your wire and cut off extra if possible. * The standard switch is 1 1/4" x 1 1/2" x 5/8" thick. This switch can be installed (using double sided tape) just about anywhere. You can also hide it, and just leave the switch in the on position if you like. You can also take this switch off the harness and use one of our handlebar mounted switches with this harness. * The relay may be hid anywhere or even mounted with a 1/4" fastener. There are no exposed terminals on the relay.